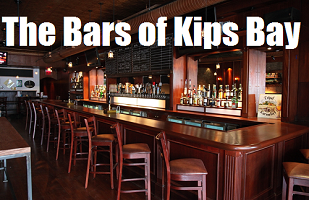 Kips Bay is a neighborhood on the east side of the Manhattan, east of Third Avenue between 23rd & 34th St. It borders Murray Hill to the north and Gramercy & Peter Cooper Village to the south. It gets its name from Dutch settler Jacobus Hendrickson Kip. Places of note in Kips Bay include Baruch College, The School of Visual Arts, and Bellvue Hospital. Taproom No.307 is a craft beer bar located in Gramercy offering over 40 different craft beers on draught, over 40 bottles and beer infused dishes. Beer bar specializing in craft beer from Europe and America with a rotating lineup of 30 beers on tap. neighborhood bar & restaurant inspired by nineteenth century Parisian establishments, in the space of a former 1920’s bank. an artisanal restaurant & bar inspired by an English Bulldog named Winston. hospital themed hookah bar & lounge. restaurant & bar serving hibachi, sushi and Asian bistro cuisine. Tap Room No. 307 is a craft beer bar offering over 40 different craft beers on draught, over 40 bottles and beer infused dishes.